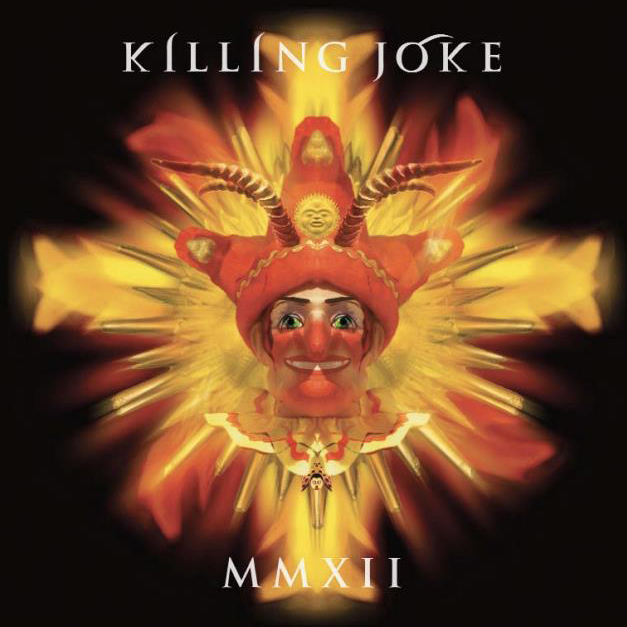 Killing Joke’s 15th studio LP – “MMXII” (or “2012”) is the second studio LP since the original line-up of Jaz, Geordie, Youth and Big Paul re-formed four years ago, the re-union spurred on by the tragic death of Paul Vincent Raven (RIP). Now, as you may have noticed if you look around, Gods & Alcoves love Killing Joke, and I have written about the fact that when the original line-up got back together, the sound was, and is, altogether better (as typified on Down by the River, the recent live LP), but I was sadly disappointed when the boys released Absolute Dissent – their come-back LP. It was, and is, a mess, primarily in the sonics department. The mix is murky, muddy and has a real lack of detail. The snare drum sounds really woolly and cardboardy (the Great Cull – aaarrrgghhhh) and the guitars are soaked in reverb to the point of losing all clarity, and they’re too loud which in turns masks any quiet sounds and removes the opportunity to add textures and layers. I find it a really difficult album to listed to, which is a real shame as there are some cracking tunes on it screaming to get out (I think I remember reading somewhere that there were disagreements during the mixing). For me this was a real missed opportunity. So does MMXII fare any better? In a nutshell, yes. And by a long, long way. This is a cracking LP, and is still getting better, even after a half dozen listens. It has its low spots, sure, but the many highlights more than make up for it. I am a big fan of the early Killing Joke. 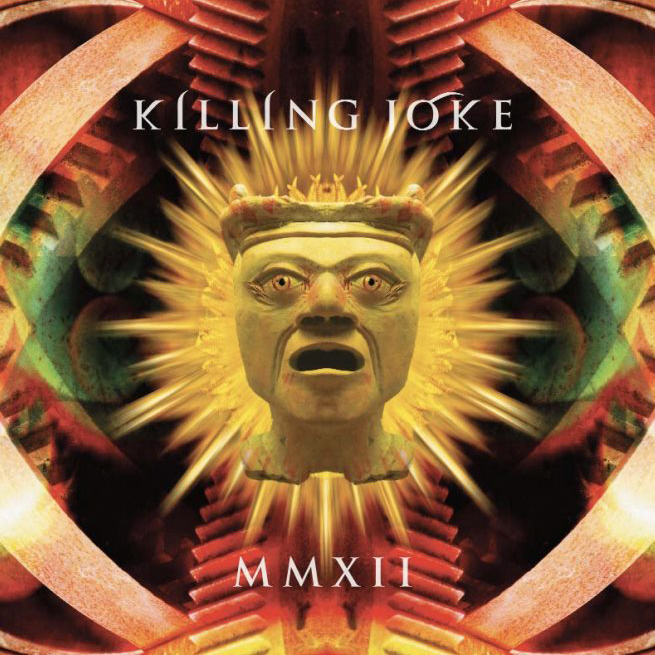 I know that there are many among the Killing Joke fraternity who feel that their later work is where the energy and power is, as they moved towards a more industrial-rock sound, but for me the energy in Killing Joke is in the stark, post-industrial sound they captured – and to a degree the sound they invented – on the early singles and the first three LPs. And MMXII draws heavily from this period – there are riffs, chord progressions and signature sounds present which, for me, are taking the sound back towards that early sound (“Wardance, Psyche and Primitive, lend me your bass-lines and your riffs”). Fine by me. In fact the only part of the band’s sound which is radically different to how it was 30 years ago is in Jaz’s vocals – he has moved full time into the industrial field although at times old Jaz makes a quick cameo appearance – like on the single “In Cythera” where the vocals remind me of Brighter Than a Thousand Suns. But back to the present. What does MMXII sound like? Great. Songs and production. The tracks are closer to their early work, with a big bag of Extremities, Dirt and Various Repressed Emotions thrown in, especially that middle-eastern guitar thing that Geordie had going on. It’s really good to hear Jaz’s synths back as well. There are atmospheric pads (and I am pretty sure the LP’s opening pad sound is also used on Underworld’s fantastic single “Mmmmmmm Skyscraper, I Love You”), bloops, bleeps, gates and electronica/trance lines abound (although this time they are much better integrated into the overall song, unlike previous tracks like European Super State which sounded like a trance track with guitars added). The guitars have been scaled back which for me is a good thing – Geordie’s power is in his riffs and the attitude he plays them with – and it is great to hear so much distinct riffage on the LP. Just like the old days. The drums, if anything, are played a little straighter than they were. Still present are the meticulous eighths and sixteenths on the hats, but the pounding tom rhythms are confined largely to intros and breaks. Jaz is still of the opinion that for the chorus of most songs a single phrase is enough (RAPTUUUUUUUUURE, GLIIIIIIIIITTTCHH, FEEE-MAAAAA CAAAAAAAMP) and if you were responsible for Wardance then your opinion counts. And Jaz’s favourite themes all present and correct – paranoia, new world order, mysticism, paranoia, rituals, big brother and of course, paranoia. MMXII was release on Monday April 2nd, the day after the media at large reported that email and web use was ‘to be monitored’ under new laws. Mrs Gods & Alcoves thought that it was an April Fool’s Day joke when she saw it all over the front page of the Sunday Times. Well, Jaz certainly won’t be laughing at this one – I can picture his cornflakes flying across the table, and his face purpled with incandescent rage! So the songs are good, what about the mix? It’s fantastic. 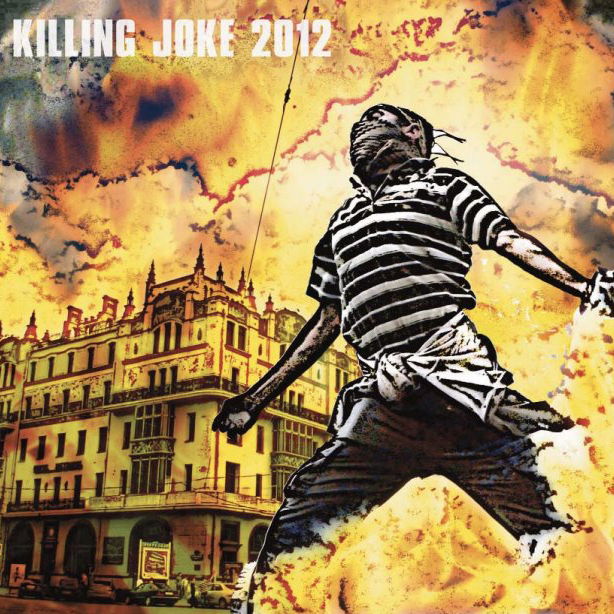 The album was recorded at Faust Studios in Prague, where Killing Joke recorded their previous two LPs (in fact in 2005, they recorded their thirteenth album, “Hosannas from the Basements of Hell” at Faust literally in the “Basement of Hell” – the name of the subterranean studio). There are some bits and pieces around the website if you do a search for Killing Joke (and it seems a lot of Killing Joke side projects are recorded here as well). Whereas Absolute Dissent is murky, MMXII is crystal clear – each instrument is beautifully defined and sits in its own sonic space. The clarity of the mix allows the layers of texture to step forward – the layered guitars, effects and the underlying synths provide richness. 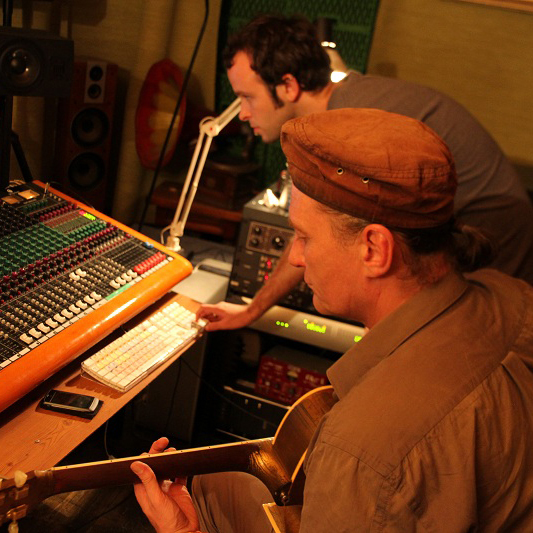 The guitar and vocal production differs from track to track. The guitar is epic and drenched in reverb when it needs to be, and it is throaty, punky and focussed when it needs to be. The vocals go from dry and up front to barely audible as they decay through layers of reverb and delay. The attention to detail in the mix is excellent and the overall sound is always balanced, the bass is deep and consistent, the mids are spikey without being abrasive and the highs fizz. The LP opens with Pole Shift, its long synth intro sounds exactly like the synth from Underworld’s “Mmmmmmm Skyscraper, I Love You”, but it breaks into a lope, bass pulsing away, and then the chorus breaks, double time, double energy, and just a touch of Pssyche at the end. This track, like the second track Fema Camp, sound like they could come from Extremities, Dirt and Various Repressed Emotions, Fema Camp again has a languid pace, plodding synths and a funereal vibe (Beautiful Dead). The guitar riff has a middle-eastern vibe to it, and the choruses/bridges are relentless. I was reminded of Primitive as the end ground away. Rapture picks up the pace considerably and sees Jaz return to the pulpit to deliver another sermon. This song is supposed to describe a Killing Joke gig and I expect it will be a live favourite for a while. The ominous synth has touches of What’s THIS for…! about it. Colony Collapse sees the album really get into its stride. This track opens with a staccato synth line with guitar harmonics over the top and then breaks into a gallop as the rhythm section cavalry arrives. The verses strip back to the bass/synth/drums and the groove is infectious. Jaz describes Killing Joke as “death disco”, and here’s the mother lode. Tribal. When the choruses pile in and the guitars open up it is about as big as any Killing Joke track I have heard. The mix is big, wide and deep but always crystal clear. Clive Goddard – hats off to you. This has to have a shout for best track on the LP. Corporate Elect is, in old money, the end of side one and it is a side which has been building nicely getting faster and faster, or is that more intense – lyrically, musically and sonically? A bit of both. This track is punk. The guitars are more middly, throaty (bridge pickup style) and, is that the ghost of Eighties lurking in the sound? Certainly Nighttime-ish in vibe. At the end Geordie cuts the guitar out using the pickup selector, and it sounds exactly like the very end of the 7” version of Wardance. Side two opens with In Cythera, a much more gentle vibe, up tempo but kind of fast but slow. This sounds like a father/son track, and all of the band have lost their fathers now, so a tribute to them. Cythera is a Greek Island, but I don’t know the relevance of that. The track reminds me of Brighter than a Thousand Suns – guitars, structure, mix and especially the vocals. Primobile is a slower track and opens with a Gary Numan style synth riff, covered in slow guitar arpeggios, then the verse breaks into the chorus and then the guitars get BIG and the vocals become ethereal, psychedelic, almost dreamlike while managing to turn into a scream. Glitch opens with the guitar riff, and the synth sound, from the rising section at the end of the chorus of Kings and Queens. This progression first surfaced on the unreleased early version of Killer Dub. Fast and dirty. Imagine Kings and Queens part two. Trance is really good. The whole vibe reminds me of Psyche (and that’s the third time I’ve written that and this is a good thing) – the bassline in the chorus is almost lifted directly from it. Excellent track. Relentless. On All Hallow’s Eve is a strange one, a slow, hypnotic, nursery rhyme of a song. They often close with experimental tracks which sound like jams – Dregs, Madness, Ghosts of Ladbroke Grove spring to mind – but I wouldn’t dismiss this track quickly I think it’s a grower. New Uprising is the iTunes bonus track (and over 6 mins) and I am baffled as to why this is an extra track. This has a shout for the for best track on the LP and, if like me you bought the CD, rush over to the iTunes store and part with 99 hard earned pence immediately! It opens with trance synth line mimicking the heavy guitar riff which joins it later. The track is an up tempo and has a blues-y, James Ray-ish kind of vibe. And man it bangs along. After Absolute Dissent I was prepared for more of the same. And I couldn’t be have been more wrong. It is an absolute cliché to say “return to form”, but here goes. A right royal return to form. 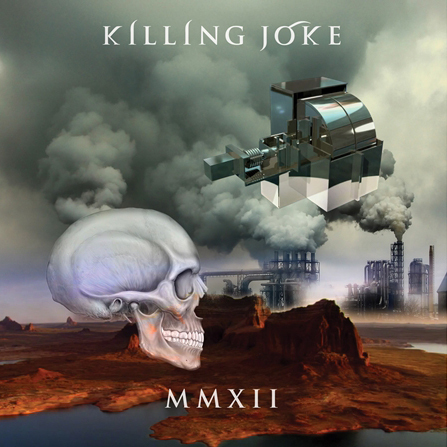 In my opinion this is the best thing Killing Joke have released since extremities – 22 long years ago. Still vital, still vibrant and only 50 years young. More power to you. These YouTube videos do NOT do the fantastic sound of the LP justice, have a listen, work out how great the LP is, then go out and buy it, and stick the headphones on and relax.